Discovery Education and the Discovery Educator Network are excited to announce another special promotion exclusive to STAR Discovery Educators. 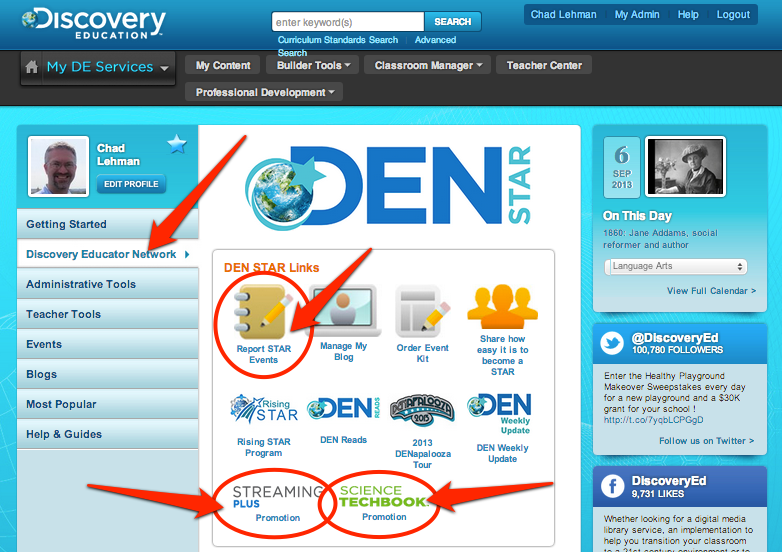 As a DEN STAR, you now have special access to the new Discovery Education Streaming Plus. Your access will run through the end of October.It gets better. You and your fellow community members can extend the special access through the entire 2013-2014 school year. All you have to do is continue to report your DEN activity. The goal for the DEN Community is to report at least 2,013 events by the end of October. If the community reaches that goal, the special access to Discovery Education Streaming Plus for all STARs will be extended through June 30, 2014. You don’t need a special account to access Discovery Education Streaming Plus, it’s already been added to your DE Services on your STAR account. Discovery Education Streaming Plus includes all of the multimodal resources you are used to seeing, but also features a custom-built destination that provides educators with instructional pathways, relevant content, and assessment tools specifically designed to support implementation of the Common Core State Standards (where applicable). Your willingness to connect to each other and share is what makes the DEN an amazing community and there’s not a doubt in our minds that you will exceed 2,013 events. In fact, you are well on your way. As of today, there are already over 900 events reported. Tune in each Friday to the DEN Weekly Update to see the updated count of events reported. To help you get started with Discovery Education Streaming Plus, we’ve put together a variety of resources. Get out there and explore Discovery Education Streaming Plus, and don’t forget to report your DEN activity to keep access until the end of the 2013-2014 school year.